While it's easy to think of Baptisms, Christenings and Naming Ceremonies to be all about baby, they're never really all about baby. These occasions are also major milestones in the lives of the family and the friends that surround the baby. With that in mind, we've extended the love by including ideas for Christening gifts for Mums, Dads, siblings, grandparents and Godparents. And of course we've also included some cute as pie gifts for the new baby boy or baby girl in your life. Let the sweetness begin! A Christening or Naming Ceremony is the ideal time to again rejoice at the new little boy who's entered the world. This adorable modish canvas collage gives plenty of room to include photos of baby boy in his first few months of life. 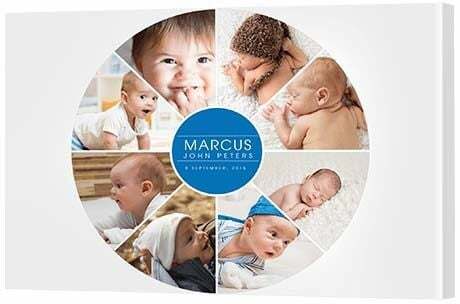 The centre circle is a perfect spot to include a personalised image where you can creatively provide his birth name and birth date. The wonderful thing about this gorgeous gift is that you simply need to stalk Mum and Dad's Facebook page to discover a treasure troves of baby photos. 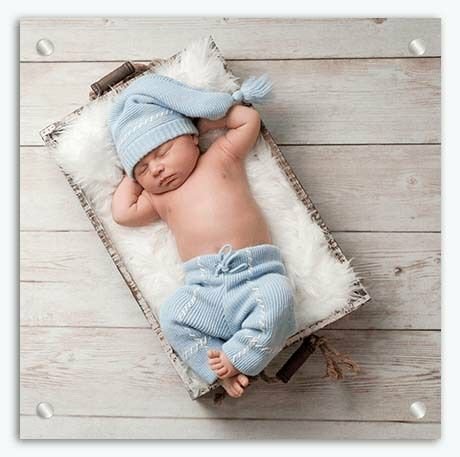 Treasure new life with an Anne Geddes inspired photo print, the ideal Christening gift for the parent who has everything. Feature the little guy in gorgeous glass. He won't be this little for long, but at least you can enjoy the cuteness for years to come. Have the proud parents arranged a photoshoot for bub yet? If not, get the family to all pitch in and gift them with a session with a professional photographer. Of course, you could try this at home, but it's a rather complex composition so perhaps best left to the talented few who can achieve this level of perfect cuteness! Choose the best photo and print it on stunning acrylic glass, a great way to ensure the print endures into the future. Celebrate pink perfection with a themed collage that takes the idea of canvas baby gifts to a whole new level. 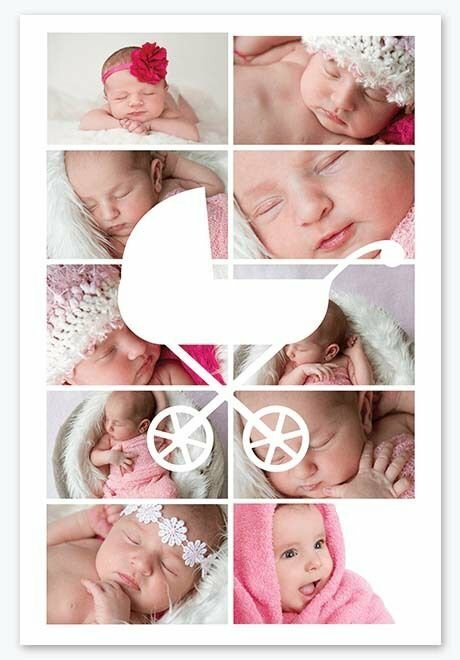 For the same price as a single canvas print, you can print this 'Baby Blessing' themed canvas with space for five photos. Choose photos of the recent baby girl arrival from new born to 6 months, present it to her parents and watch them turn to mush. Not a fan of pink? Prefer to think that blue is for girls? Don't let convention stop you. This themed collage template also comes in a fun aqua colour. One of the most fuss free Christening gifts for girls, all you have to do is dig around for the right photos. Demand her parents give you their 'pick of the bunch' or scour their Facebook and Instagram pages for all the gold (or pink!) that you need. 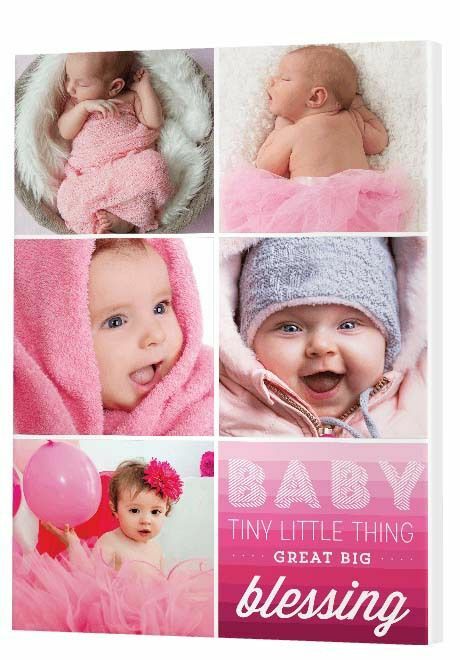 Here, we've chosen cute pink baby girl photos to match the 'Baby Blessing' template and, while it works really well, it's certainly not essential. With this versatile template, you can choose any type of photo you like. Besides, it's hard to fault a baby photo right? What is essential is making this happen before that special baby girl's Christening or Naming Celebration. Truly unique Christening gifts are hard to come by, but this collage - with 10 photo frames to fill - gives you 10 good reasons to make this the gift they will remember. Cute and hip. That is what this baby girl will exude with her adorable little self placed 10 times on a modern metal print. Brushed aluminium provides oodles of personality on a good day. Add baby and you achieve greatness. Instantly arty, this silhouette collage design printed on metal screams 'cool'. Can a baby be cool? Well now she can without evening learning to walk or talk yet. If you think 10 photos of baby is a bit too much (ridiculous notion really! ), you may consider using some of the frames to include Mum, Dad and older brother or sister. The wonderful thing about this super cute template is that you can colour the wrap and the carriage. You can use the eye dropper tool in the CanvasApp to choose a colour from the photos or you can pick any other colour you like. Don't be quick to discount brights and earthy tones. Even black can add impact, particularly on metal. Metal collage prints only come in two sizes, so if you're after something bigger you may have to look at canvas. However, the result in metal is so unique, sometimes sacrificing size for style is worth it. Let's hear it for the Mums! 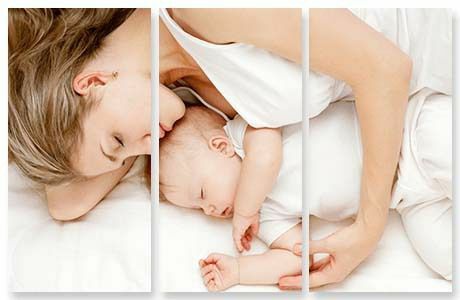 This split image canvas print is perfect for the yummy mummy who can't bear to let go. Surprise your wife or the new mother in your life with a print that celebrates the precious relationship she has with her newborn. As not every photo will work when split across three panels, the trick is experimenting in the CanvasApp until you find the image that works best. Monochrome is a magic way to display Dads with their littles ones as it transforms the tenderness of a moment into a masculine timbre. At Canvas Factory, a full colour print is the same price as a black and white print, so choosing which colour to print in is a creative rather than financial decision. 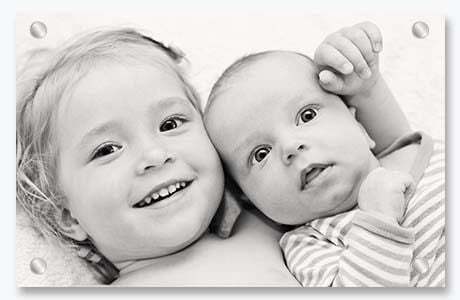 Capture the closeness between Dad and baby on camera then display three photos across a stunning canvas wall display. To achieve this look, you can photograph in colour, change your photos from colour to greyscale in a photo editing program on your computer or, very simply, upload your colour photos into our CanvasApp and choose grey in the Effects tool. Using the Effects tool, you can change the colour of each individual photo, so if you're inspired to get creative and leave one panel in colour and the other two in mono, you can! 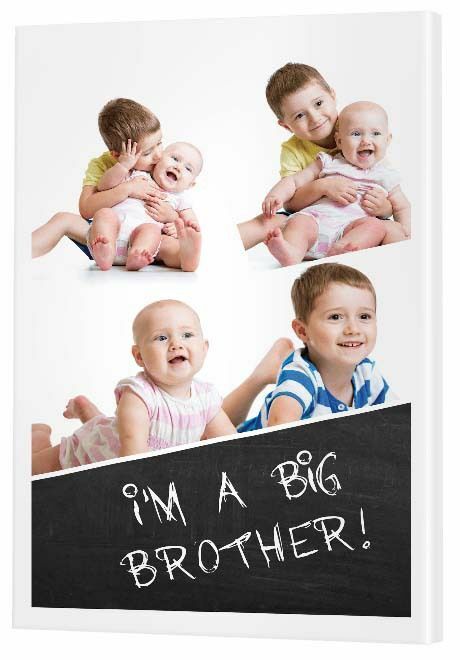 Stave off any jealousy surrounding the big day with a fantastic Christening gift for big brother. While it's important for the big brother to understand this is a day to celebrate the new baby's name, the idea of personalised christening gifts for the older sibling is all about sharing the attention and affection around. This four panel modish design has a frame at the bottom that's ideal for a personalised message. You can design the image in Canva with any text you wish to feature. For example, 'I am a big brother' or 'I am a big sister'. Choose a square or landscape design, but keep the text placed towards centre of the image so there's plenty of colour surrounding the text. Print it to 'PDF: For Print' then download and resave the PDF as a JPEG. Use the Canvas Factory CanvasApp to upload your image to the modish collage canvas template. Here we've chosen to print the personalised image as white text on a black backgrond, but you can choose any colour you like. Growing up together is going to have its highs and lows, but why not get the relationship off to a running start with a warm-hearted gift that celebrates big sister love. The closeness between a big sister and her new baby sibling is one to be remembered and treasured. That peaceful bond won't last forever, so capture the play and the smiles on camera and print it on long-lasting glass. Here, we've removed the colour to create an arty black and white print on acrylic glass, but you can choose to use a full colour photo at no extra cost. This is a gift for the new big sister to hang in her room, so she can remember - forever and always - that special bond. At the baby's baptism or naming ceremony, be sure to capture photos of the new proud grandparents to include in a Christening collage. Best. Day. Ever. 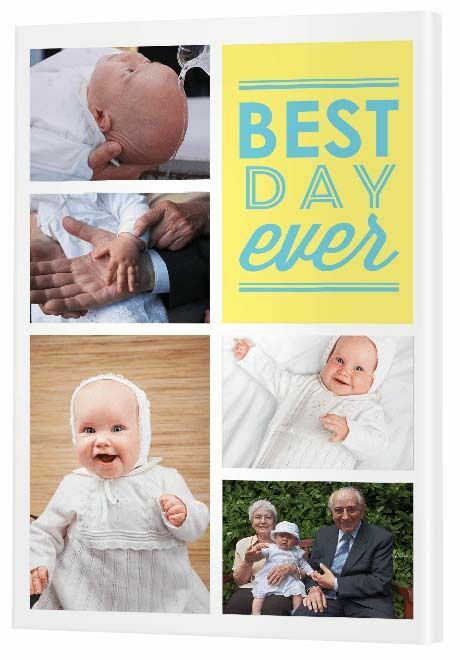 This themed canvas is ideal for featuring fond memories of special occasions, in this case baby's Baptism. The idea here is to gift the grandparents something special to thank them for who they are and all that they do. With this gift from the heart, they'll never have to give baby back! They can enjoy reflecting on their precious grandchild and that special milestone any day of the week. The key is to ensure your event photographer (even if it's just a family friend!) takes the time to take a photo of their newly Baptised grandchild with the loving, doting grandparents. Then fill the rest of the panels with photos of baby in his or her Christening outfit and, voila, a gift that will move them beyond measure. If you'd prefer to design your own customised panel of text or would like to include more photos, be sure to check out our Traditional Collage range. While it's usually the job of the godparents to gift the child something special to celebrate their admission to their Christian Church, why not turn it around? Like the parents, the Godparents are in it for the long haul. This gift, to be given by the parents, is to acknowledge the commitment their friends (or family members) have made and to thank them for their continued support. While you can take this photo anytime, it's a wonderful idea to arrange this on the day of the ceremony when baby is wearing their Baptism dress. You can split an image across stretched canvas, acrylic glass or brushed aluminium. There are a number of different styles of split image available to choose from, so feel free to get creative.